Robert McGee was born to an average couple in an average city. His home was small, but still fairly average for commoners; he had a reasonably warm bed and enough clothing and food to get by. His parents worked long, hard days at their import shop, which sold a variety of strongly scented herbs, overly perfumed soaps and oils, and other exotic items. Robbie spent much of his time helping out at the family shop sorting and refilling spices, the smell of which embedded itself in his clothing and made his nostrils burn. The family earned enough to get by, but it was no fortune. The McGee family ate a lot of grains flavoured with some of the herbs from the shop, as well as bread and what meat they could afford (which was often poorer cuts his mother marinated in herbs and liquid to mask the quality). Robbie and his parents worked well into the night each day and began again early the next morning. Hygiene was not a huge priority as finding time to visit the local bathhouse was difficult and costly. As a result, Robbie was teased mercilessly from a young age for his poor hygiene and strange odour. Children would chant “Stinky McGee” in his presence, and very few children ever played with the pungent adolescent. The growing boy distanced himself those around him, assisting his parents or exploring the fields outside of town alone. Over the years Robbie learned how to turn his emotions off, deadening himself on the inside to the world around him. He passed more time than he would ever admit to his parents inspecting the carcasses of creatures he found, and even killing some wildlife, and once a stray dog, he happened upon. The cold distance with which he performed these acts is what would have troubled the McGee’s more than anything else, but the parents remained blissfully unaware of their son’s pastime. When Robbie grew older he decided to leave town. Taking a supply of goods from the shop, the youngest McGee thought he might have some luck as a traveling merchant. He knew his parents would need him in the coming years, but Robbie wished to see life outside his hometown, and secretly also wondered if he might be able to move the business somewhere else. With his parents’ blessing, Robbie set out. What Robbie came to find was that there was indeed a market for goods such as his family’s out on the road. In a very short time, Robbie sold the majority of what he had set off with, and, having noticed the eager faces of many potential patrons, had done so at a higher cost than his parents normally charged in the shop. The days were just as long, and time on the road perhaps less pleasant than in town, but Robbie enjoyed the solitary nature of it. Pleased with his progress, his bags near empty of their goods, and his pockets laden with coin, Robbie found lodgings at a nearby inn and decided to treat himself. Rather than order the least expensive food items available, Robbie decided to savour his success with a strong glass of ale and a meat and cheese platter. The smoked meat was delicious in the way so many roasts of his youth had not been, but it was the cheese with its strong flavours and unusual texture that delighted Robbie. After enjoying much of the tavern fare Robbie stepped outside to the back ally to relieve himself. Here he inadvertently found himself listening to the end of a negotiation between two parties. One, a well-dressed man with a hood pulled low, was bartering with the other, a poorly dressed half-orc with several knives at his belt. From what he could gather, the half-orc was trying to increase the rate of services he was offering, and the human was frustrated by this. 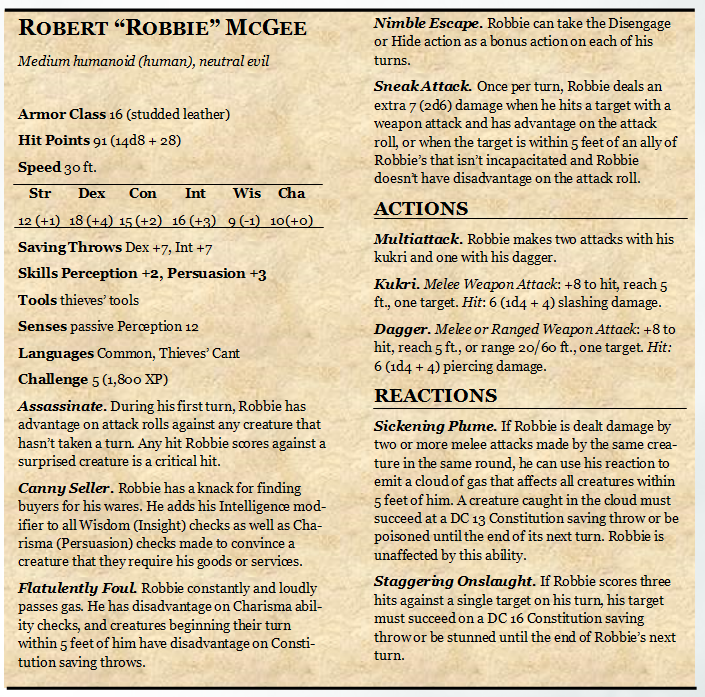 At Robbie’s appearance the half-orc appraised him, scowled, and looked back to the human stating if he changed his mind, he knew where to find his services. The half-orc rounded the ally toward the main street and the human looked in Robbie’s direction. A brief conversation ensued where the human became frustrated with Robbie for interrupting his business deal. While not always the canniest of people when it comes to people’s emotions and motivations, Robbie quickly determined less than reputable dealings were transpiring in the ally. Robbie cared very little for anyone but his parents, but he was distantly curious, full of satisfaction from his job well done, and emboldened by the copious amounts of food and drink he celebrated with, and so somehow, he convinced the man he might be able to help. That evening Robbie walked away with the first job in his new career. The execution was easy; he simply slipped into the house via a window, dispassionately murdered the woman, and left the scene. Robbie found his ability to feel so little for so many, to be so distant from everything around him, was a huge asset in this line of work. The fee was substantial, and the work even easier than travelling with a large volume of goods and speaking with people long enough to convince them to purchase said goods. Robbie wanted to return to his parents; he wanted to help them with their business. He also wanted to do this. That night, after he returned to the inn, his blade wiped clean on some discarded clothing, Robbie felt ill. At first concerned he had been poisoned, and then perhaps cursed, and so the next morning Robbie made his way home. Travel was slow at first, but as the days passed and Robbie ate the rations procured some days prior, the pain began to subside. Feeling intrigued with the possibilities of completing more jobs like the one he recently done, Robbie returned home with the funds he had received the goods he left with. His condition cleared up while he resumed living with his parents, dining on seasoned meat and vast quantities of rice and other grains. He told his parents of the success of travelling with the goods, and the three of them agreed that for as long as Robbie wished to, this would be a good business practice. Within a few days Robbie set off once again, travelling here and there and peddling his wares, but he also kept his ear out and made contact with a few less than savoury people in the various places he visited. Before long Robbie had built himself a reputation with the “right” people, and had begun a second business of sorts – a hired hitman. All the while the traveling merchant found himself obsessed with cheese and other delicious milk products, seeking out more varietie s in each town he came across, and enjoying it with every meal he could. Along with his new-found love of cheese, Robbie discovered something else about himself: his body had trouble digesting the milk protein. The malodorous man, who was used to the foul looks of those around him, realized he hadn’t been poisoned that first night, not exactly at any rate: from what he could tell his new favorite food caused him minor gut pain, and the most flatulent of farts. For some time now, Robbie has travelled from town to town, completing jobs for those need to simplify their lives or have messages sent and peddling his parent’s wares, all the while indulging in the fare that causes him (and those around him) such anguish. 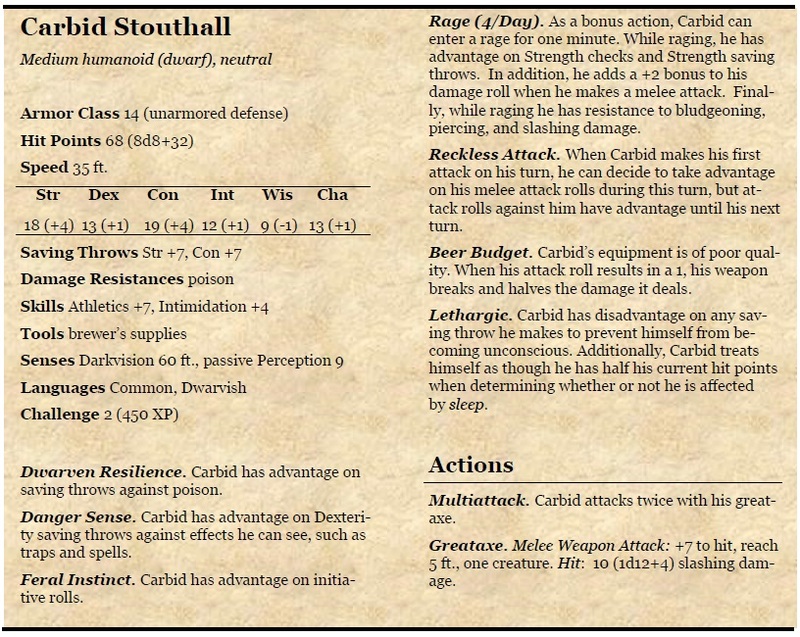 Looking to add an NPC to your Starfinder session? Look no further! 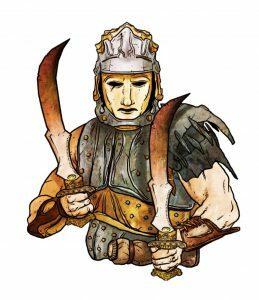 Shades the Blade was originally featured in 5e NPCs: Goblins! Goblins! 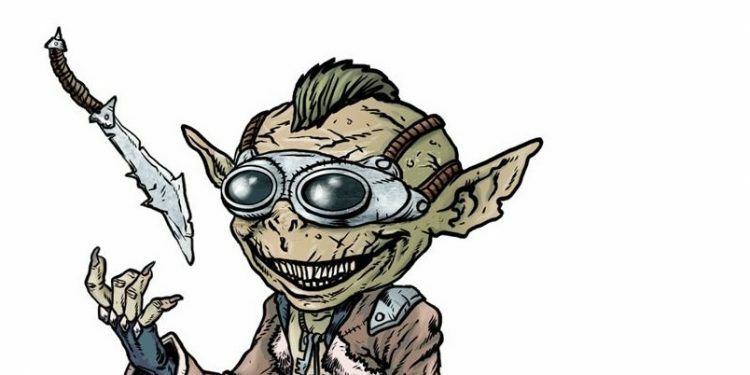 Goblins!, but has been lovingly crafted into a Starfinder NPC. If you love Starfinder, keep an eye out for our upcoming Tangible Tavern: ICON. 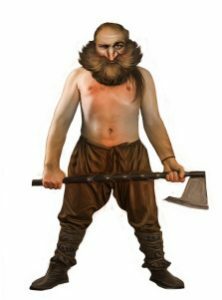 Tarrgk Facegump was like every other member of the Flayback Tribe: vicious, impulsive, greedy, and short-sighted. The day the burning ship fell from the sky onto the Flayback camp he ceased to be impulsive and short-sighted. That was the day that Tarrgk Facegump died and Shades the Blade was born. When his tribe’s camp was destroyed, Tarrgk and a small band of warriors were returning from an unsuccessful raid, laden down with their dead companions. Upon seeing the burning craft strike their home like the finger of a vengeful god, Tarrgk’s companions fell to their knees and begged forgiveness for their failures. Tarrgk, however, did not. He had seen something break off the crashing structure and arc to the east, and after the crash, he could see a faintly blinking white light some distance in that direction. Sensing opportunity, he snuck away from his companions to investigate. About a mile away, Tarrgk found his prize: a segmented metal cylinder the size of five goblin tents. As he approached the cylinder, a door sized portion of it folded out into stairs with a hiss, creating a softly glowing entryway. The goblin cautiously hefted his spear and entered the cylinder with a mixture of trepidation and excitement, sure that he had discovered something truly valuable. As Tarrgk passed through the door, a terrifying, man-sized creature with a smooth, glassy black face lunged at him, stabbing him with some kind of fine spear attached to a liquid filled shaft. Tarrgk thrust his weapon at the thing reflexively, stabbing it deep in the thigh and killing the already mortally wounded monster. As the rush of adrenaline subsided, Tarrgk’s head began to swim, and he passed out. When he awoke mere moments later, Tarrgk was changed. He understood the cosmonaut he had killed had not intended to attack him; she had injected him with a nanite solution that connected Tarrgk’s brain directly to the escape capsule’s central computer, effectively making him smarter and more canny than he had been. The connection also informed Tarrgk that the nanites would work to keep their host safe, knitting almost any injury suffered and making his body and mind hardier. Tarrgk used his enhanced knowledge to assemble a resonant blade, an extraordinarily sharp knife that doesn’t suffer the effects of friction, and that returns to his hand at his mental command, and a pair of tinted goggles. He also found the craft’s stealth module and rendered the ship invisible to all but the most advanced sensors, though he can always locate it due to the nanite’s connection to its central computer. Finding his fellows far more limited than himself upon his return, Tarrgk quickly abandoned them, and his name. With the new name, Shades the Blade, he set out into the world ready to sell his services to whomever was willing to part with sufficient funds. Shades takes on nearly any task, regardless of the danger, as the nanites heal even the most grievous wounds rapidly, though he is quick to retreat in the rare instance that his injuries are slow to disappear. In his youth Jago was often called handsome. His square jaw, deep brown eyes and flawless skin made him the object of desire for many of the girls about town. When Jago smiled, it was as if the room lit up. His muscular stature, earned from moving heavy goods and otherwise helping with the family business – a small import shop – further enhanced his appeal. Despite his status as a commoner, many of the noble girls in town took notice of the good looking young man. Jago enjoyed the attention, and the affection. By the time he neared the end of adolescence Jago had numerous lovers, and had caught the eye of the very wealthy and notable Tillie Anne Sharperre. Tillie, an attractive young woman of noble breeding, was the epitome of a lady in public, but she was also an emotional rollercoaster behind closed doors. While Tillie was often passionate and adventurous during the secret moments she found with Jago, she was also prone to jealousy. Tillie demanded that if she and Jago were to continue, she be the only woman in his life. While Jago balked at the request initially, he quickly realized Tillie meant more to him than any of the other women. He called things off with his other lovers and assured Tillie his feeling for her were pure and true. Tillie’s parents had promised her to a nobleman in town who was slightly older than the bride-to-be. She was disinterested in the relationship, but knew it was her duty to follow through. Tillie convinced herself that even after the union she would be able to continue her relationship with her beloved Jago, and he promised her the same. As spring flowers began to bloom the wedding day drew closer; Tillie and Jago did what they could to find time together, while keeping their relationship a secret. Three nights before the wedding, Tillie and Jago met for what they believed to be the last time before the wedding. After a passionate kiss goodbye, and promising to visit Jago as soon as she could get away, Tillie set off, unaware it would be the last time she would see the handsome face of the man she loved. Tillie’s future husband had begun to suspect something was amiss with the young girl and, determined not to be made a fool of, had hired someone to follow her. When news came of her lover, he was furious. The nobleman hired thugs to ensure the relationship ended. The brutes cornered Jago in an alley and beat him, punching and kicking him, and even slashing his face until he was barely conscious. They told him if he loved his parents, he’d never see Tillie again. It took some time for Jago to recover. He convinced everyone he was the victim of a mugging and had no idea who the attackers were. While the family business was successful, neither he nor his parents had enough funds to procure the services of a magical healer, and the attack left Jago horribly disfigured. Where he once caught the eye of many a fair maiden for his picturesque features, they now did their best to avert their curious gazes from his scarred and misshapen face. Despite the warning, Jago was desperate to see Tillie. His mind raced with the possibilities of her state – was she happy in her new marriage? Was her husband kind to her? Did she know of what happened to him? He convinced himself he could stay far enough away from her that no one would notice his presence. Once Jago was well enough to travel about the city on his own, he set off to see Tillie. He was concerned about the welfare of his parents, but his love for the young woman was strong. He positioned himself in an alley that looked out at a busy street and here he waited for his beloved to pass by. Even those who didn’t give the alley a wide berth paid him no notice, as he hid in the shadows deep in the alley with a large cloak wrapped around him for warmth, the hood pulled low over his face. After some time the fetching young lass moved down the adjacent street. Jago heard her laughing and his heart leapt with joy, but he also became nervous. Was there anything she wanted to say to him? Did she miss him? Was she as happy as she sounded? Had her marriage caused her to forget him? Jago hadn’t even realized his feet were moving until he had stepped out of the alley. His hood fell back over his shoulders and he came face to face with the love of his life, who was accompanied by a friend and two servants. He wanted to reach for her, despite all the reasons not to, when she recoiled, a look of terror upon her face. Heartbroken, Jago fled immediately, consumed with the knowledge that the beautiful Tillie Anne, his lady love, found his disfigured face repulsive. Jago ran. He was hardly even aware of his actions as he returned to his home and hastily packed a few belongings. To this day he can only vaguely recall stealing the horse from the stable in a nearby inn, his appearance startling the stable boy into a corner and leaving him so speechless he couldn’t even bring himself to call for help. Jago rode the stallion into the night, and set off again the next morning. For days he travelled, blind to where he was going, knowing only that he must escape the small town and distance himself from the woman who now viewed him as a monster. Jago, heartbroken and betrayed, swore to himself he would never love again. It never occurred to him in his haste to depart his home, to distance himself from the look upon his beloved’s face, that Tillie was not repulsed by him, but terrified of a figure emerging from the alley, surprised at Jago’s presence, and astounded at what had been done to him. It never crossed his mind after that brief moment that she still loved him and that her heart broke each day over their last encounter. When Jago eventually stopped in a town he had never before seen, he found a shop selling masks. Here, his hood pulled low, he petitioned the shop keeper to fashion him a custom face mask, one that would ensure no one ever looked upon his face again. Every year as the first spring flowers bloom, Jago’s heart breaks at the memory of Tillie and what they once shared, but he continues to move forward, desperate to put his memory of her, of their love, of the way she looked at him that final day, behind him. For years he has travelled the lands, targeting wealthy nobles with brutal acts of reprisal. It is hard to say for certain which bothers him more: those truly in love or those together for social status, but both become the victims of the masked man who leaves one or both of lovers broken, disfigured, or dead in the hopes it will bring him some solace for what he lost so many years ago. 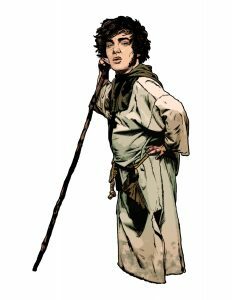 The youngest of nine children, Briony spent her childhood trailing after her eight brothers and emulating them in every way she could. With them as her mentors she learned how to follow a trail, set a snare, hunt, fish, fight, and drink. This made her mother, Brynhild, very unhappy; Briony was Brynhild’s last chance to join their family with a wealthier one, as the boys had all been deemed too rude, too stupid, or too ugly to be paired with any eligible young noblewomen. Every time Briony came home covered in dirt and bruises with unkempt hair and torn clothes, her mother would admonish the young girl as she cleaned her up, explaining that it was important that she be demure, pretty, and accommodating. No well-heeled gentleman would marry a woman who was prone to speaking her mind, let alone fighting, after all! As she neared adulthood, many young noblemen, mostly from minor houses, came to call on Briony, having heard, mostly due to Brynhild’s constant promotion, that she was a rare northern beauty with alabaster skin and ashen hair. During these visits, Briony would try to sit in silence as her gentlemen callers would extol her with tales of their wealth and influence in the region. Inevitably, however, she would grow bored and do something these fine young men deemed unladylike, such as disagree with their opinions, belch the alphabet, or challenge her visitor to an armwrestle… and win. Many suitors visited, and all of them left with the opinion that Briony was too inappropriate for their household. Not wanting a man who did not accept her for who she was, or who would infringe upon her independence, Briony did not take her callers seriously, much to her mother’s despair. When she reached her twentieth naming day, Briony sold off her belongings and used the proceeds to purchase her axes and a custom suit of armour designed to be as revealing as possible; despite rejecting most of the things her mother taught her, Briony certainly remembered Brynhild’s admonishment that she must be pretty at all times. Briony is now a veteran of many conflicts, not all of her own making. 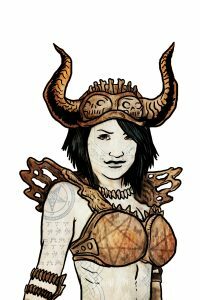 She has been a soldier of fortune, a pirate, a tomb raider, a treasure hunter, and many other things. She lives from campaign to campaign, filling her spare time with strong drink, athletic endeavours, gambling, and lovers of all races and genders. She lives her life to the fullest, satisfied that nearly anything she desires is within her grasp. 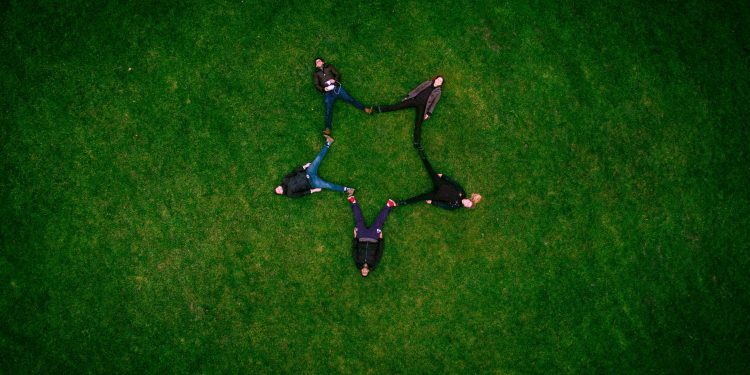 But once in a while she finds herself wondering about her mother’s health, or whether any of her brothers have married, or if they have made her an aunt, and she pledges that she will return to her childhood home and find out. One day, she may even do so. What did you think of this NPC? Did she make an appearance in your game session? They help writers write what you like. They help game companies produce materials you like. They help other potential customers discover a product you like. And they help you since with your feedback, more products you like will potentially be created. Ask any small 3PP company and they will tell you the same thing. Ratings are great, and they do help. They are a great confidence boost to the creators, and they might help potential purchasers make a decision, but even better than a rating is a rating with a few quick notes about what was great, what you’d like to see more of, what you’d like to see less of, etc. Yes, there are, but isn’t more than one person’s opinion better than a single opinion? Maybe there’s a review of a product, but you have a completely different point of view than that reviewer, or the review is skewed? Would you rather buy a product that has one 5 star rating? Or one that has one 5 star rating and two 4 star reviews detailing what the reader liked and didn’t like? There are lots of 3PP companies out there. It doesn’t hurt to have lots of people writing reviews. Reviewers like Endzeitgeist do a fabulous job of pouring over dozens and dozens of game files in a month and producing just as many detailed reviews. Not everyone can do that (and hey, speaking of help and reviews – he can’t do what he’s doing without help, so if you love his reviews consider backing his Patreon). Not everyone should even think of aspiring to that size and volume of reviews. Little reviews are good too. Well written concise reviews. A few random thoughts. A play account. A deep look at one aspect of the file. Constructive criticism or praise for well written work. All of these help the game industry. And if you are a gamer who loves 3PP work, that means it helps you. If you read one of our products and haven’t written a review yet, think about writing one! As a special thank you from us to you for taking the time to write a review, we’ll send you a copy of any one of our products. Write a review, post it to Paizo or DriveThruRPG, and then contact us with the link to the review and a request for one of our other products. We’ll send it on over, and you will have one more resource for your game night! How do you contact us? On our website, by email, or even over on Facebook. But don’t just think of us. If you have read something you loved, write about it! The little guys like us will thank you! If you play PRFPG or D&D you are no doubt familiar with the magical sack that holds damn near everything. This bag is the answer to an adventurer’s every problem (or close to). Loads of loot to drag home? Just toss it in the bag, it barely changes the weight. Need a bedroll or a tent? I probably have an extra one in here somewhere. Some GMs are more of a stickler for how much you can fit in one of these puppies and exactly what can go in, saying some items are too big to fit inside the mouth of the bag, or that the item itself could puncture the bag, destroying it and either expelling all the items, or sucking them and nearby people into a whole heap of trouble. No matter how your GM rules, or what you use it for, no doubt this enchanted bag has made its way into more than one game session. If only there was something like it in real life, right…? Well, sort of. See, during our latest solo-campaign, which was meant to be a one off during vacation, my character was busy scavenging goods to survive in a zombie-filled-post-apocolyptic world after she got separated from the group had been living with, and their secure compound. Ken, my husband, GM, and fellow Dire Rugrat Publishing companion, hand waved the contents of some purses. Not much in there, he said. Mints, some recipients, that’s about it, he said. The room had been untouched to date and I found more in the cheap motel’s bathroom than I did in the middle aged woman’s handbag. I shrugged and figured she was one of the few women I know who keeps her bag to a minimum. I wanted to focus on playing, not raise a stink about a hand-waved handbag in a savage story, but it kept happening. Then it occurred to me: most men have no idea exactly what lays in the depths of these mysterious containers. Indeed, dumping out the contents of my purse at any given time either causes my husband to stare in wonder or back away slowly (I have since been much more careful to remove any perishable food). There’s seemingly no end to the random junk in the bottom of an oversized purse. Much like a bag of holding, a woman’s purse can produce any number of random long forgotten object, and can store a great deal. From the incredibly helpful flashlight or screw driver to the useless lone child’s sock, these bags were (at least in my opinion) an untapped resource in a world four years into a zombie apocalypse. In an effort to help him out (*cough* gain more awesome resources), I started making a list. I dumped out my purse. I asked around. I looked up pictures of the content of people’s bags (oh Flickr and Instagram, how helpful you can be). I even found the random bags I’ve emptied my purse contents into before a trip (those were some random items in there I’ll tell ya!) and inventoried what I found. The result…? Over a hundred various items with varying degrees of usefulness. Of course, an item’s usefulness is related to the situation and the imagination of the bearer. I’m sure, given enough pressure and few enough resources, a creative mind could put damn near every item in a bag or two to good use. 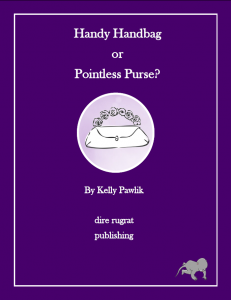 The full PDF of Handy Handbag or Pointless Purse? 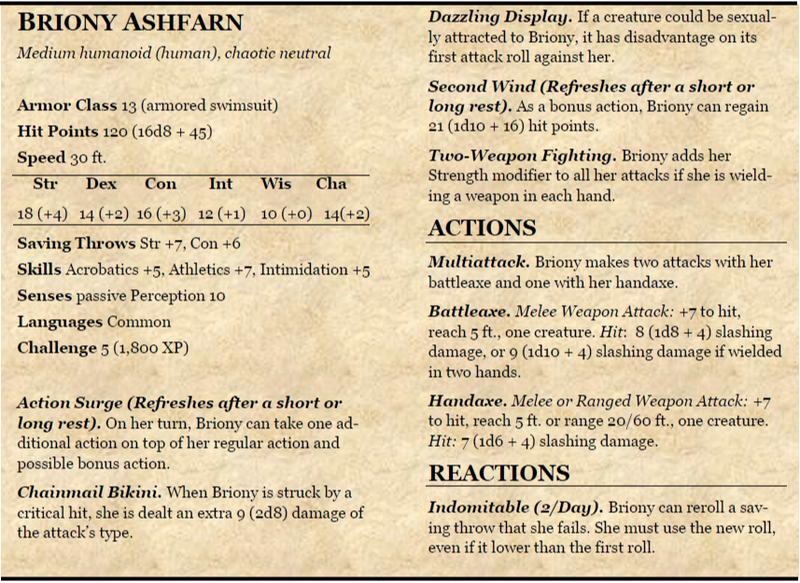 is now available over on DTRPG, but as a sneak peek, I’ve included one of the tables below. Being the mother of 3 charming (and exhausting) rugrats, I’ve picked the Caregiver Table. 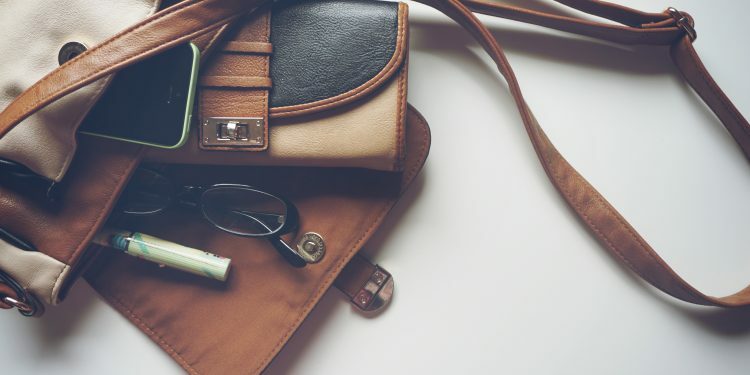 This particular list is one that only applies to certain handbags, but the contents could be useful to anyone, depending on their desperation. Some of the items are more humorous than helpful. Rugrat #1 couldn’t stop laughing about a few of them, but I assure you that either myself, or a friend, has had any one of these items in their bag at some point. Ready to add these items? Roll 2d4 – that’s how many items from the table will appear in the bag. Now collect 3d12, total the results and find the matching item. Repeat for each item and voila! Repeats are okay, unless you don’t want them to be. I assure you, and I’m sure fellow parents can agree, when in doubt – throw another one in! Did you try out the table? What did you end up with? What’s your favourite item? We want to head from you! Royston and Petunia were a match made by the gods. Both dedicated to the intense study of magic, the pair were a match for just about any that crossed their path. Petunia had begun her studies early in life and excelled quickly. When she met Royston the two maintained a friendly feud for a time, but eventually admitted how they both felt. Their love was intense and pure, as strong as their combined forces against those that would move against them. 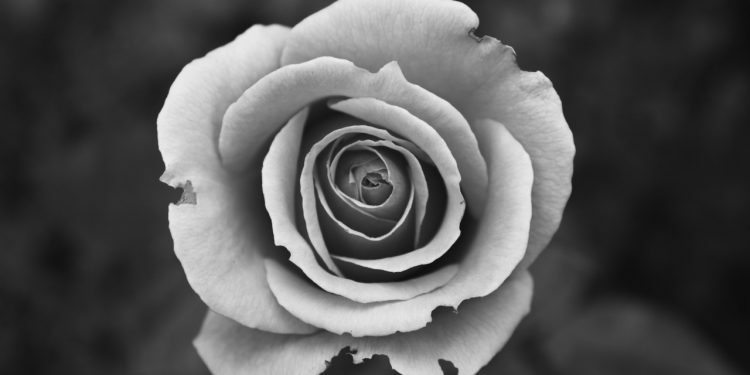 Petunia was kind hearted and generous, no matter how powerful she became. At her insistence, the pair helped those in need, and always came to the aid of the rulers of the kingdom in which they resided. They quickly developed a reputation for charity and Petunia especially was beloved by the villagers. After some years together Petunia became with child, and their son was born some months later. Little Billet with his brown ringlets was celebrated by everyone in the kingdom, and Petunia and Royston had never been happier. One day, when Billet just a toddler, a band of orcs that had been growing restless in the nearby mountains attacked the city. Officials, as well as Petunia and Royston, had been keeping an eye on them, but they had seemed disorganized and scattered. The sudden organized attack had been impossible to predict. Petunia and Royston hurried to assist the city. Petunia hid Billet in a nearby home with some trusted acolytes and proceeded to the hilltop where she would have the best vantage to fend off the opposition. She had almost reached her destination, and smiled at the sight of her beloved Royston aiding the town, when a she heard a squeal from Billet. She pivoted on her heel, concerned her young child had followed her into the danger zone. Her eyes met his only for a second before the assassin who had snuck inside the walls was upon her. The unsuspecting halfling was no match for the silent murderer, and right there in front of Billet, she perished. It was a single wound to the throat, but all Billet could see was blood, so much blood. The young halfling fainted. Royston, also hearing his son, had turned and seen the whole thing. He and the nearby guards quickly dispatched the assassin, but it was too late. Despite her husband’s best efforts, and those of the local healer, Petunia could not be revived. The city managed to fight back the orcs, with a number of casualties, but none were more grievous to the city than that of Petunia. Royston was devastated, but he collected Billet, and prepared himself for a life without his beloved. His father, consumed with Petunia’s death, poured all of his energy into his own studies, and those of his son in whom he instilled the idea that he was destined for greatness, that he was to follow in the footsteps of his parents. Royston became increasingly powerful, eventually surpassing the skill of his late wife and drawing the attention of numerous people, both admirers and enemies. Royston no longer wished to assist the helpless citizens of nearby towns. No one else in his family would sacrifice their life in service to the weak and incapable. Billet struggled with his studies, much to the disappointment of his father. 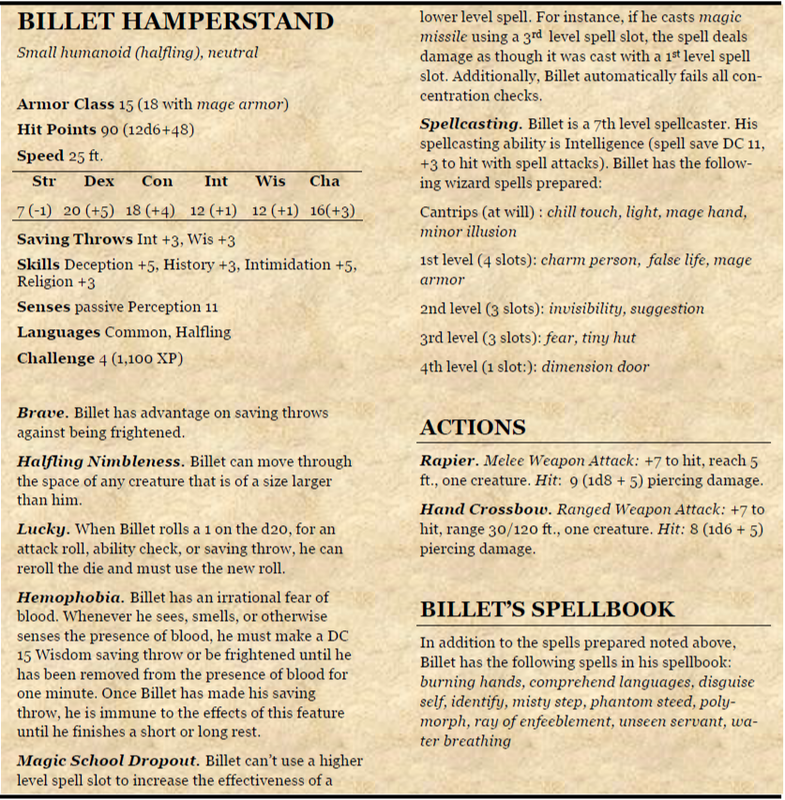 When he reached puberty, Billet was sent to an arcane academy, where his father hoped he would finally excel in his magical studies. Billet despised the school. Each day he was expected to spend countless hours pouring over old tomes, making notes, and inspecting and studying various components. Most of the other students were thrilled at the chance to learn under the watchful eyes of the instructors, but Billet just wanted to explore the world and be left alone with books full of incredible tales of wonder. Billet would write to his father, begging to return home, but he was always refused. Royston loved his son, but he was consumed in avenging Petunia’s death and eliminating any threat to himself and his son. His actions resulted in many enemies, and eventually a powerful band of mercenaries caught up with him. Inside his own home, the great and powerful Royston Hamperstand was slain. When Billet hadn’t heard from his father in some time, he requested leave to go check on him. He was denied, but snuck out of the school anyway. Billet made his way to his childhood home and there he found what remained of his father. Even with Billet’s lack of medical training it was clear the death had not been quick. The place was a ruin and remains and blood covered many surfaces of his father’s dining hall. The sight and smell of blood, dried as it was, caused Billet to faint. When he came to, slightly bruised from his fall, Billet forced himself from the room and vowed to avenge his father’s death, to make his family proud. He swore he would not return to his studies at the school, and began to amass followers by announcing himself the son of Petunia Hamperstand, the beloved arcane protector. Many of those who remembered his mother came to his aid. His father’s home was cleaned and Billet began to build a new life for himself. Inside the walls of the great tower Billet’s arcane studies have ceased, despite the plethora of tomes, but his love of books in general has grown. The walls of the tower are now filled with any books Billet can procure, and he memorizes the stories, telling the accounts of protagonists as if they were his own, recounting numerous tales of grandeur and adventure. Inside the walls of his father’s tower, Billet’s hatred of orcs and mercenaries festers. He takes his frustration out on his minions, belittling them with verbal tirades before apologizing to them with grand promises. The occasional reminder of his family’s legacy and his birth right keeps the majority of them devoted, and those who falter are replaced and announced as traitors conspiring with orcs or mercenaries. A mischievous, ugly, dwarflike creature of folklore. Once upon a time, these creatures went by many other names. Elf. Gnome. Imp. Orc. Brownie. Troll. Puck. Redcap. Ogre. They were antagonists of myth and fable. The subject of cautionary tales parents would tell their children to encourage common sense and good behaviour. They were the face of humanity’s collective fear of the unknown. They were feared and respected. Goblins’ folkloric qualities have been stripped away from them in the world’s oldest roleplaying game. 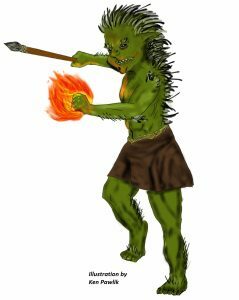 The aspects that have made them mythic across the vast and varied tapestry of human culture have been stripped away and granted to other creatures, leaving the poor goblin a pathetic, sniveling servitor to creatures that carry the names that were once synonymous with goblin. First level adventurers kill these pathetic excuses for goblinkind by the score before moving on to bigger challenges. No one fears goblins anymore. No one respects them. 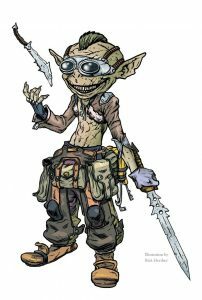 Dire Rugrat Publishing aims to change that with Moar Goblins, which features a sextet of goblinoids adapted from a variety of real-world cultures. Grindylows – aquatic scavengers and terrors of the deep. Gudro Bonga – sometimes benevolent creatures often mistaken for children. Kallikantzaroi – weird, yule ruining goblins obsessed with the destruction of the World Tree. Nacht Kabouters – red hat wearing mischief makers that travel by night. Pukwudgies – forest dwellers with a kinship to hedgehogs. Tokoloshe – vicious child stealers and vengeance takers. With challenges ranging from ½ to 6, Moar Goblins will keep adventurers busy into the middle of their career, and hopefully rebuild some of the respect goblins have lost over the course of five editions. Moar Goblins (A Mini Bestiary) was released on DriveThruRPG last week. We love our blog readers, so we’re sharing a sample of one of the goblin variants below. Pukwudgies reside in moderate climates, typically near wooded areas with fresh sources of water. If left to themselves, or occasionally gifted with offerings, pukwudgies refrain from interfering in the lives of those in the area. Goblinoids. 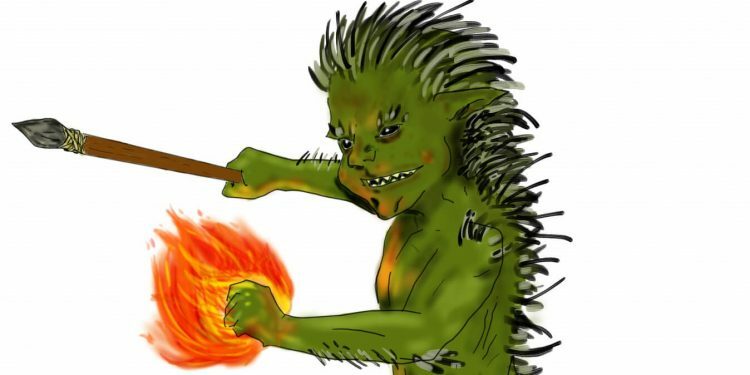 Pukwudgies were once friendly, helpful goblinoids, but their inability to share a language with and understand the ideals of those they attempted to befriend and aid resulted in many of their efforts backfiring. Over time, the creatures were viewed as a nuisance and, feeling unappreciated, the pukwudgies decided to torment those who tried to exclude them and treated them like inferior beings. Growing Resentment. The less appreciated a pukwudgie feels, the more malicious it becomes. Harmful pranks, missing items and eventually disappearing children are not uncommon in areas with tribes of pukwudgies that believe they are mistreated by humanoids. Skilled Hunters. Pukwudgies are capable hunters. Living off the land, they are adept at navigating the wilderness. They are also proficient with poison and often dress their arrows with it to take down those who dare trespass into their territory. Magical Aptitude. Drawing on their bond with nature, pukwudgies have some facility with magic, including the ability to take on the form on a porcupine. Two stat blocks accompany this variant in Moar Goblins, offering a lower level pukwudgie as well as the more capable pukwudgie shaman. Pick up your copy of Moar Goblins today and, (bonus!) if you use this link you can pick it up for just $1.50! 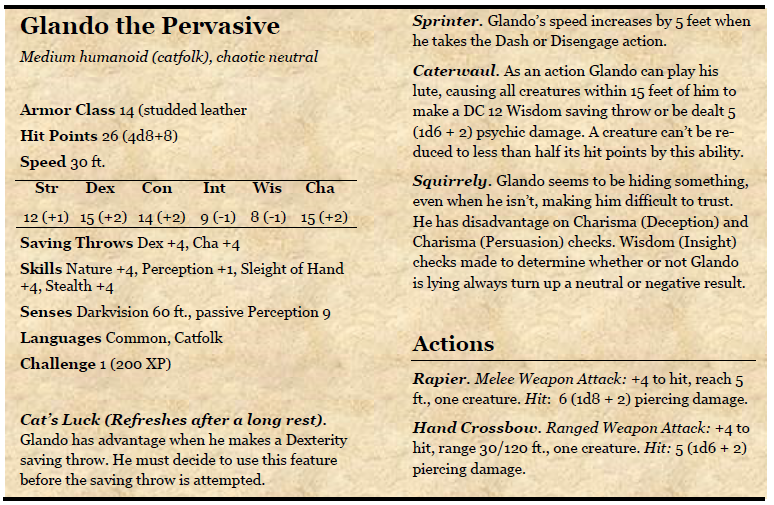 Glando the Pervasive was born to a charming catwoman and a hardworking catman. The young catfolk adored his parents, who worked tirelessly to provide their son with a good life, and remained jubilantly positive no matter what hurdles came their way. While Glando was cheerful and generally well-mannered, others in the village found it difficult to trust him; there was something about the young catfolk that seemed shifty. Over time Glando’s parents began to drift apart, and though they did their best to keep their son’s well-being first and foremost, a change was eventually needed; Glando’s father no longer agreed with the rules of his clan, and decided to leave the village, but his mother refused to give up the life she had built. As he neared adulthood, Glando was forced to make a choice – leave with his father, or stay with his mother. The young boy was devastated. As it happened, a travelling show came through his village that night. Several of the visitors were adept musicians, sporting various instruments including the lute. Glando was mesmerised. The music spoke to him and soothed him. Overwhelmed with the decision before him, Glando returned home where he collected a few belongings and, in the first rays of dawn, hid himself in amongst the wagons of the travellers. It was not until much later that day he was found and, after some pleading, was allowed to stay on with the musicians. The group wasn’t sure if they could trust him and kept their small coin purses close, but they sympathized with the young Glando and his desire to be on the road, his heart full of melody. Each evening the party would create beautiful music and occasionally they allowed Glando to try. He was horrible, but he persevered. His companions offered words of encouragement and attempted to teach him. For months he travelled with the musicians, from town to town. He assisted them with their packs and instruments, he helped draw crowds, and always he dreamed of being one of them, but he was never allowed to play with them for events. Glando soon decided they were jealous of his ability to play the lute, and when the party left town the next morning he bid them farewell and ventured off on his own with the small pouch of coin he had been paid during his time with them. The aspiring bard made his way to a local merchant who was selling a lute. 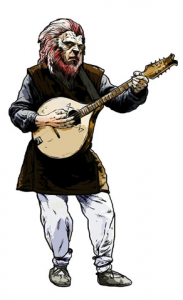 The lute, he was told, belonged to a capable and magnificent musician who met his end performing in front of a great crowd well into old age – no doubt, it could bring him the same fortune and luck. And so, with nary a coin left to his name, Glando renamed himself Glando the Pervasive and set forth to conquer the musical scene of every tavern he could find. Alas, after a year on the road Glando the Pervasive has had difficulty securing any shows and is frequently booed off stage. Due to his squirrely nature, Glando has not even had much luck hiring himself out to adventurers or merchants to provide a helping hand. He has begun to consider returning home to his village, but he isn’t sure what he will find if he does, and he fears neither of his parents will forgive him for abandoning them.